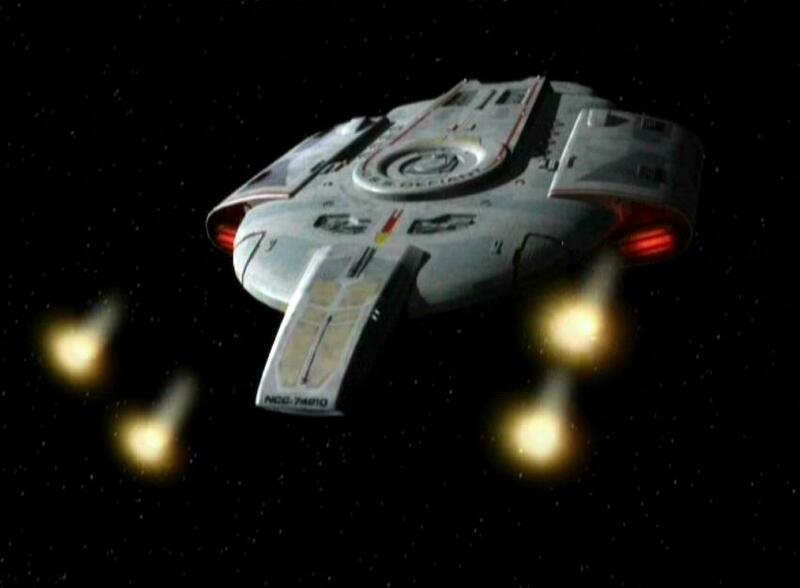 Part one: With the Dominion threat looming, Sisko brings the Defiant, a prototype Starfleet warship, to DS9. The ship has a cloaking device (on loan from the Romulans) and Sisko’s mission is to find the Dominion’s Founders and work out a deal. On board the Defiant in the Gamma Quadrant, Odo starts acting strangely and feels an odd pull toward the Omarion Nebula. As it gets closer to finding the Founders, the Defiant loses a short battle with the Jem’Hadar. Odo and Kira escape in a shuttle to find their way to the nebula … where Odo meets a group of people who look just like him. After years of searching, our favorite shapeshifter is home. 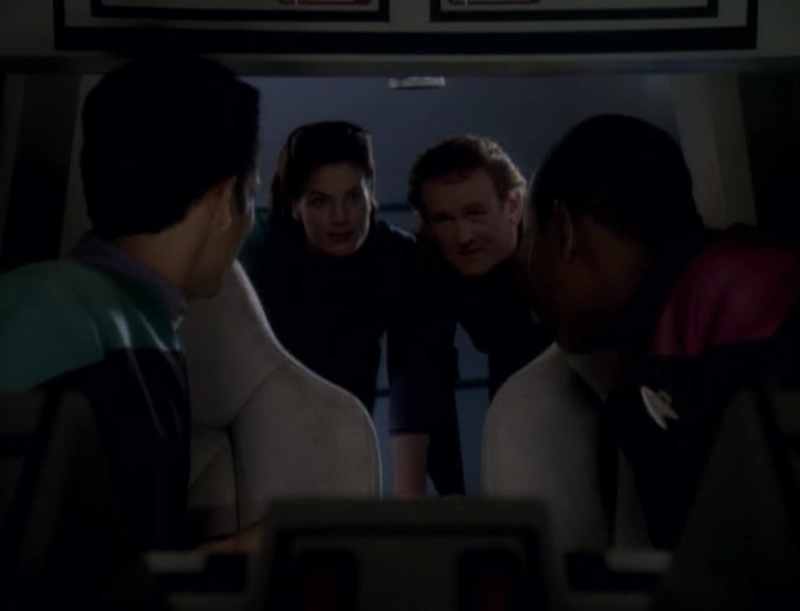 Part two: Back on DS9, Sisko and Co. (minus Kira and Odo) are told that their mission succeeded and the Dominion is set to establish an alliance with all the great Alpha Quadrant powers, minus the Romulans, for some reason. Meanwhile, Odo learns about his origins and finds that his people are xenophobes who distrusts solids. He was sent out, he’s told, as a group of 100 infant “Changelings” and wasn’t expected to return for hundreds of years. Back on the station, Sisko and Co. decide the treaty with the Dominion would give up too much — especially after they learn the Federation is going to pull out of the Bajoran system. The group steals a runabout and collapses the entrance to the wormhole. Back on the planet, Kira and Odo discover our heroes being held captive — and learn the whole ordeal on DS9 was a simulation to test their responses. Then, it’s learned that Odo’s people are actually the Founders(!). 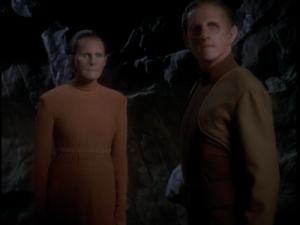 The female Changeling (Salome Jens) who’s been instructing Odo allows the group to leave … but warns that the Dominion won’t be as lenient next time. You want big dominoes — then this two-parter is for you, even if the ending to part two is sort of a cheat. The introduction of the Defiant (which is pretty badass) and other items spawning from Sisko’s return — a relationship with the Romulans regarding the Dominion, the introduction of Michael Eddington (Kenneth Marshall), Starfleet’s new security chief at DS9 — shows the magnitude of what happened in “The Jem’Hadar”. DS9 had a lot of turning points, but the first part of “The Search” is as big as any in the series — even without the introduction of Odo’s people. And, of course, they’re not just Odo’s people. The Changelings turn out to be the Founders of the Dominion! Talk about a jaw-dropping couple of hours (or, couple of 45 minutes). DS9 was the best Trek series at showing consequences. Sometimes, the creators stacked the deck too much against our heroes only to have to backpedal — the threat of Changeling infiltrators in the middle seasons — a threat that largely passed — is the best example. But, what we see here is really compelling storytelling that was ahead of its time. What we start seeing in the third season of DS9 — and particularly, in the fifth, sixth and seventh seasons — was more akin to the great serial dramas of the 2000s than the episodic fare of the 1980s and 1990s. The super cool starship Defiant. 1) Sisko’s mission is to reach out to the Founders and create a dialog — essentially, a peace mission. To do so, they send him on a ship that is armed to the teeth. Not exactly an olive branch. Meanwhile, the ship is barely operational! This is something that we saw a lot of in the Trek movies — the Enterprise would be sent on a key mission despite not having a full crew or being fully operational — and it was as goofy then as it is here. 2) Part one begins with Kira talking with the senior staff (minus Sisko) about how they could defend the station against a Dominion attack. It’s necessary for exposition (I guess) but it seems odd to have the convo apparently two months after the events of “The Jem’Hadar”. What had they been doing for two months? It’s not weird that the conversations were ongoing — but the dialog would seem to indicate that they took forever to reach pretty obvious conclusions. 3) Things actually get stranger in part two. While the stuff on the Changeling planet (until the end) is fine, the “events” on the station are really strange. Sisko (who’s not even a captain, let alone an admiral) is just too annoyed about being kept out of the loop during the “peace negotiations”. Not only is he low-ranking (relatively speaking) he was in a shuttle with a Bashir for most of the talks. Would it even have made sense to just throw him in? 4) Then, as the Dominion’s experiment continues, it’s hard to believe that Sisko and Co. would go as rogue as they did. O’Brien getting beat up by the Jem’Hadar was clearly shocking — as was the murder of the Romulan T’Rul (Martha Hackett). But the crew acts like they are a helluva lot smarter than their superiors. At this point in the series, Sisko’s connection to the Bajoran faith is still tenuous — he only begrudgingly accepts the Emissary stuff — so it’s not totally out of the question that he’d blow up the wormhole. But the punishment doesn’t fit the crime. 5) Then, there’s the whole business of how the Dominion left the Defiant in orbit (and possibly repaired it?) allowing our heroes to leave and (apparently?) return to DS9 after Odo gets the female Changeling to let them go. The Defiant was “dead in space” at the end of part one, according to Odo, so did the Dominion repair it? But more than that, did the Dominion expect to let Sisko and Co. return after the experiment? Shouldn’t they have been tearing the ship apart to learn about Starfleet’s new defensive capabilities? It’s not at all a stretch to say the Dominion hadn’t seen a ship like the Defiant before. As noted, this two-parter is entertaining but it’s just got a ton of logical issues. The Sisko and Co. being too big for their britches shows up later in season three — and we saw a touch of this at the beginning of season two when Sisko used the flimsiest excuse to remain on the station despite orders (and the Prime Directive) that should have kept him out of an internal Bajoran matter. As DS9 progresses, Sisko’s role in Starfleet and Federation grows enough where it’s not hard to figure he could go on to some of the big things that he did. But, at this point, he’s two years off being stationed in a back alley of space as a mid-level administrator! Enabaran Tain takes the fun to the Dominion.